B2B transactions ensure increased accuracy and therefore improves invoice and PO matching. Increased order accuracy also results in improved forecasting for maintaining inventory levels. Items are assigned specific GL codes that can be used for accounting software integration. Items selected on the requisition (account, department, project, supplier, etc.) are correctly coded for seamless integration into the accounting system. Point Purchasing gives the Accounting A/P department an easy and accurate way to manually enter supplier bills or create threshold rules to allow approved suppliers to automatically enter bills via the cXML Invoice transaction. Utilize powerful reporting capabilities. Run summary reports by Cost Center, Supplier, Projects and more. 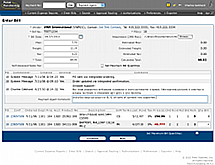 Create custom reports to your specifications. Output report results to Excel compatible file. Restrict users to specific departments and assign projects and line item types/accounts to departments. Assign authorizers to specific line item accounts, regardless of dollar amount of requisition.